WATERVILLE -- Colby College is undergoing $37 million in construction projects, including a renovation and addition at the Museum of Art, a new science building, and a new storage building. 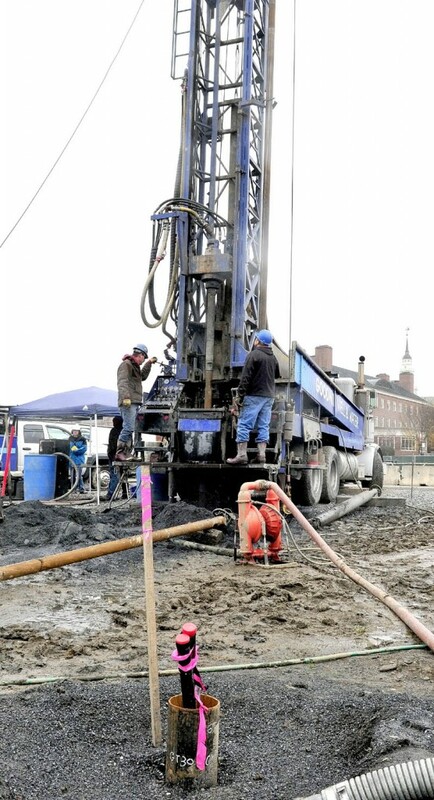 WATERVILLE — Colby College is undergoing $37 million in construction projects, including a renovation and addition at the Museum of Art, a new science building, and a new storage building. The $18.6 million, 36,400-square-foot science building on the north tip of the Colby Green off Mayflower Hill Drive will house the psychology, computer sciences and mathematics and statistics departments, according to the college’s physical plant director, Patricia Whitney. Construction of the three-story building, which is the fourth and final structure to be built on the green, started in September and is expected to be completed in 2014. The $15 million museum project includes renovation and a 26,000-square-foot three-story addition that will be the Alfond-Lunder Family Pavilion. It will showcase more than 450 works of art that have a value that exceeds $100 million, donated to the college by Peter and Paula Lunder. When the Lunders promised the gift in 2007, they emphasized they wanted the art to be accessible to Maine residents. The Harold Alfond Foundation contributed $5 million to the museum project. Work on the museum started in September 2011 and is expected to be completed next summer. The third project is a $3.6 million, 25,000-square-foot storage building being built on Colby-owned land off Washington Street, which stretches from the campus to Kennedy Memorial Drive. Part of the one-story building will be climate controlled and will store documents and low-use library volumes. The unheated part of the building will house items including furniture, athletic equipment and dining equipment, according to Whitney. The college currently uses trailers to store furniture. 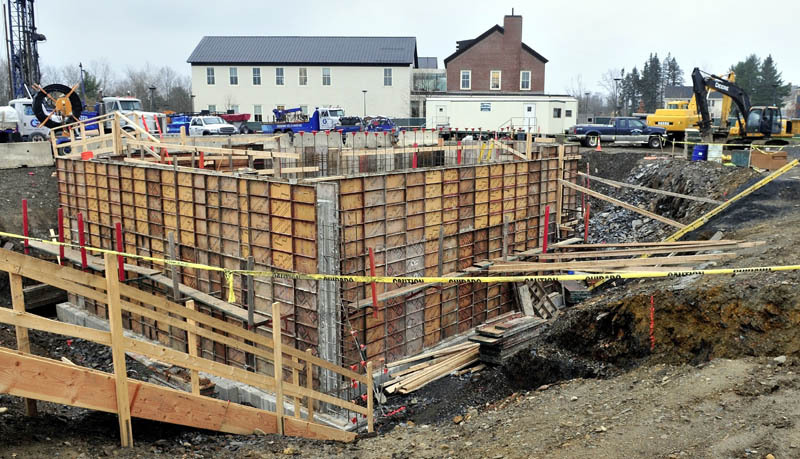 Ouellet Associates Inc., of Brunswick started work in July and the building is expected to be completed in the spring. The construction projects follow the college’s strategic plan, which was developed starting in 2000 when William Adams became Colby’s president. “When a new president comes in, it’s a good time to say, ‘What is the college going to need over the mid-to-long-term in terms of facilities to support academic programs, residential and social life and athletics,'” Colby spokesman Stephen Collins said. He said the strategic plan is based on careful consideration of the college’s needs, determining where the college is going and what is needed to get it there. In the last few years, the college, which is on 714 acres and has an enrollment of about 1,800 students, has completed several other projects. Among them are a new biomass plant, which went online in January, and four dormitories on Roberts Row that have been renovated, with the fifth and sixth to be completed next summer, according to Whitney. The Harold Alfond Stadium and Bill Alfond Field also were completed during the last 10 years. The new science building, whose general contractor is HP Cummings Construction Co., of Winthrop, will be geothermally heated and cooled and have a brick exterior with a lot of glass, according to Whitney. It will have classrooms and state-of-the-art-laboratories, student research areas and offices and smaller study areas to support research and project-based learning. When the mathematics and statistics department moves out of the Mudd Building and into the science building, it will free up space in the Mudd building to house other sciences, which are in overcrowded places now, according to both Whitney and Collins. The psychology department and computer sciences are housed primarily in the Roberts Building and will move closer to the academic center of campus when they settle in the new science building, they said. Roberts will be renovated into residence halls. “The domino effect is helping both the academic side and student life, which is nice,” Whitney said. When the science building is completed, it will be the tenth campus structure to receive LEED, or Leadership in Energy and Environmental Design certification, from the U.S. Green Building Council, she said. Once the museum addition is completed, it will be the largest museum in Maine, according to Whitney. The addition and renovation is being done by Consigli Construction Co. Inc., of Portland. The installation is by American artist Sol LeWitt. Collins said one of the missions of the museum is to make it accessible and welcoming to the community. “It’s not just for Colby students,” he said. The addition, visible to motorists on Mayflower Hill Drive, will house galleries, staff offices and storage, as well as academic space on the top floor. The size of the museum’s lobby has been increased significantly and the ceiling raised as part of the project, Whitney said. A multipurpose space has been added that is geared toward school groups that visit the museum. “That has been a real priority of the museum for years, as it brings busloads of public and private school children from all over Maine and really sees this as a resource for the community,” Collins said. The Alex Katz gallery and a small adjacent gallery are open and accessible via a temporary entrance on the north side of the building, but most of the museum is closed during construction. The final event in Colby’s bicentennial, being celebrated in 2012-13, will be the opening of the Alfond-Lunder Pavilion.